This book brings together an engaging study, using Emmanuel Ghent’s collected papers, of theoretical and personal origins of the relational turn in psychoanalysis. 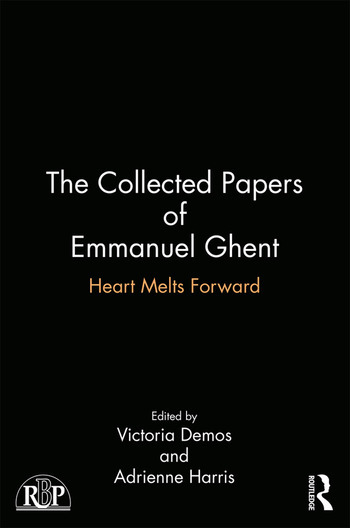 Emmanuel Ghent was one of the founders of relational psychoanalysis, and his ideas have been hugely influential. However, he published sparingly and his papers are scattered across a range of sources. In this book, his key writings are reproduced, along with analyses and critiques by major contemporary psychoanalytic figures such as Adam Phillips, Jessica Benjamin, Seth Warren, Adrienne Harris and Barry Magrid. This book provides a thorough examination of the key tenets of Ghent’s thinking and illustrates the continued importance of his theoretical and clinical work for the next generation of psychoanalysts. Medicine Man(nie): Commentary on Emmanuel Ghent's "Paradox and Process"
Introduction to E. Ghent, "Interaction in the Psychoanalytic Situation"
Victoria Demos is Supervisor at the Institute for Contemporary Psychotherapy, New York. Adrienne Harris is Clinical Associate Professor of Psychology (Adjunct) and Clinical Consultant on the Postdoctoral Program in Psychotherapy and Psychoanalysis, NYU. "Heart Melts Forward is a book, of course--and so when we consider it, we think first of Manny’s writing, which was prescient and brilliant, and which continues to serve as one of the primary inspirations of the entire relational literature. But it was because Manny was the person he was, the whole person he was, that he became as beloved and influential as he was. Luckily for us, his personhood suffuses every one of the gripping and profound articles collected here. In reading this book you will be standing on the foundation of relational psychoanalysis. But there will be more: if you didn’t know Manny, you will wish you had. "-Donnel B. Stern, Ph.D., William Alanson White Institute and NYU Postdoctoral Program in Psychoanalysis and Psychotherapy.